Bounty Hunter has proven to be an update that thousands upon thousands of players can't get enough of. Since Thursday, world 18 Edgeville has been absolutely packed with lots of blood-hungry Bounty Hunters looking for their next kill. We would like to offer a few more additions to the rewards shop to give it a little more variety, along with a more sustainable stock of items. The items proposed in this blog, if introduced, would bring long-term value to the Bounty Hunter rewards shop and would bring some more unique content to the game. On the initial Bounty Hunter rewards poll we offered an item called the Saradomin's tear. This would act in a similar way to the Kraken tentacle, boosting the stats of a Saradomin sword but consuming it after a certain number of hits. This just barely failed the poll. After receiving a mountain of feedback, we have re-worked the Saradomin's tear to be a little more appealing while remaining balanced. It will have the following stats and special attack. Special attack (uses 65% special attack energy): Deals one attack with a 25% damage increase. This attack will be dealt as magic-based melee damage. After 10,000 hits with the blessed sword, the Saradomin sword is consumed and the player is left with the Saradomin's tear. This creates an item sink for the Saradomin sword, something that will help keep the profit of Saradomin Godwars dungeon nice and high. The special attack dealing magic-based melee damage makes it very useful for a number of PKers. While the overall damage of the special attack is reduced (the standard Saradomin sword is capable of hitting higher) the ability to hit once and avoid protect from melee is something that will appeal to many. The granite maul is a weapon that is loved, and hated, by pures. It is one of the strongest weapons in the game against low defence enemies but is utilised much less by players with higher combat levels. 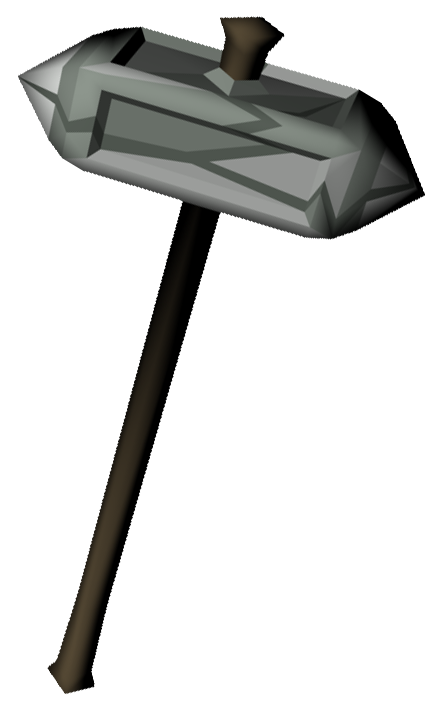 The hardened granite maul is a simple upgrade for the granite maul. As you can tell by it’s the sedimentary marks and the indentations on its outer shell, the granite maul has now be compressed to more aerodynamic form for increased accuracy. The crush attack is increased from the +80 the granite maul provides to +95. The hardened granite maul crumbles to dust after 1,000 hits. This change will not have much of an impact on the area of the wilderness where it is already incredibly strong, pure PKing, as accuracy is less significant against lower defence levels. However, it will open up the weapon to be more useful for mains, offering some variety for higher leveled players. We would like to give the magic shortbow (i) a little upgrade so the stats of the weapon better represent the value it holds in the Bounty Hunter rewards shop. At the moment the uses for the magic shortbow (i) are fairly limited. The only improvement the shortbow holds against the standard magic shortbow is the ability to use two special attacks in a row. As many players have pointed out, there are very few circumstances in which players would want to use back-to-back specials. We would like to add a small increase to the range attack, taking it from +69 to +75. This would give the magic shortbow (i) a little more to offer, as the accuracy increase is fairly generous, without taking it overboard. Back in July we polled several graphical reworks for items that were recently added to the game. These reworks came as close as 1% from the 75% threshold but, unfortunately, most of them failed. We would like to offer these reworks as cosmetic upgrades purchased from the Bounty Hunter rewards shop. This would allow players that prefer the original models to stick with what they know while letting players interested in Alfred's re-works get their fill as well. Teleport to target was a spell back in the times of Bounty Hunter craters. It would allow you to teleport directly to your target. We would like to offer an unlockable teleport to target spell as a reward from the Bounty Hunter rewards shop. Players that are willing to take on the risk of teleporting into the unknown will be able to surprise their targets, or get a surprise themselves. The spell would offer a new element of risk vs reward to Bounty Hunting, something we know PKers love.